One of the advantages of working in the Wall street area is the availability of getting to fabric stores easily on my lunch break or after work. During yesterday's lunch break, my venture took me to PS Fabric in Chinatown [359 Broadway, New York, NY 10013 (212) 226-1534)], where I walked among the masses of tourists, street vendors & those just out & about. Honestly, for the average person, yesterday wasn't a normal day to venture out for fabric, it was all-out humid, sticky, overcast and raining on & off, but I love overcast days and if the rain is debuting I won't let that stop me. The Sewing Divas can tell you better, during our meet ups on what they call a beautiful sunny day, I can often be overheard whispering how blasphemous for it to be so darn sunny & hot, and also found criss-crossing streets to walk along shadowed buildings to avoid the sun ...lol Just a few weeks ago, I had the pleasure of hanging out in the Garment District with the Sewing Divas and we had the nerve to venture out on the hottest day in New York City... please don't ask what we were thinking. Well, we were thinking the fabric stores would cool us off during our pit stops, so with that thought, we enjoyed a beautiful lunch, then began our walk along 7th Avenue. Less than a nano-second we started to bake like crispy cakes, instantly dipped into a fabric store...mmm.. it was hot as hell in there. Left that store went into another, it was subtly cool, you know that cool you feel when you first walk in, but as you proceed farther in... zip... your forehead starts beading up with sweat, we looked around quickly and moved on to the next. There was one store we did endure the lack of air conditioning because there were some great fabrics to be had (35th St. Fabrics). Well after several more fabric and notion stores, we ended our hottest day meet-up at a super cool cafe for dessert and vowed the next meet-up will have to take place during the cooler season. .... a reversible plaid or should I say reversible Fauxberry fabric. 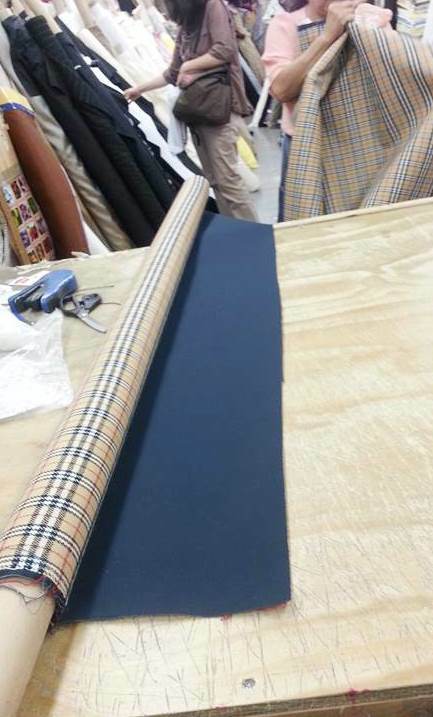 The salesman did a burn test and was able to ascertain that the plaid fabric is a synthetic and the navy blue side is cotton. My first purchase was 3-1/2 yds @ 9.99/yd, but once I returned to work, I thought further about how I would like to use the fabric, specifically a coat and decided I would return for the remainder. Oh did I say how hot and humid it was.. I was a sweating jelly fish.. Not sure what I was thinking when I got dress that morning, but wore a long sleeve blazer. I didn't waste any time and returned after work. There were 3 yds remaining already cut in 1-1/2yd increments. Of course, I dipped into my haggle mode all smooth with sweetie and oh dear and by the way love... and tried to find any imaginary imperfection I could, even down to where a swatch was cut. End result... 3 yds for $22.00. Woooowee!! If you ever find yourself in the area, I hope that you will enjoy it as much as I did! I would love to turn this fabric into a reversible coat, hence the additional fabric, But first and hopefully tonight I will serge all the raw edges and wash the fabrics and let air dry. Last night I attempted to sift through my pattern book for coat projects, but after a long day I didn't get far & fell asleep. Now that I think of it... I need to update this book. Firstly let me say that I like your doodling, and secondly, you really scored on that fauxburry. Can't wait to see your trench - oh, you didn't mention a trench did you? I just want to reiterate everything that Faye said. Thanks Faye, tonight I serged one piece and now its being washed. Hope to serge & wash the remaining pieces and let air dry. I would love to do a trench with the details, epauletts, rain flaps & sleeve tabs, but being that I want a reversible coat, it needs to be a simple jacket w/o the bells & whistles. Thanks Adelaide, that is so cool that your daughter is taking a fancy for sewing. P.S. Can you tell us more about your notebook??? OMG! You had me laughing in this post, I'm so jealous... I can't wait to see the awesome coat you'll make. Also, I'm really loving that outfit in the top right photo in your header. And last but not least, I totally love your doodling, and dabbing and what ever else you do but stay committed to sewing. I've been trying to get back on the sewing wagon and just can't get my mojo working. I may have to come up there for a meet-up to get some mojo rubbing off on me...LOL! 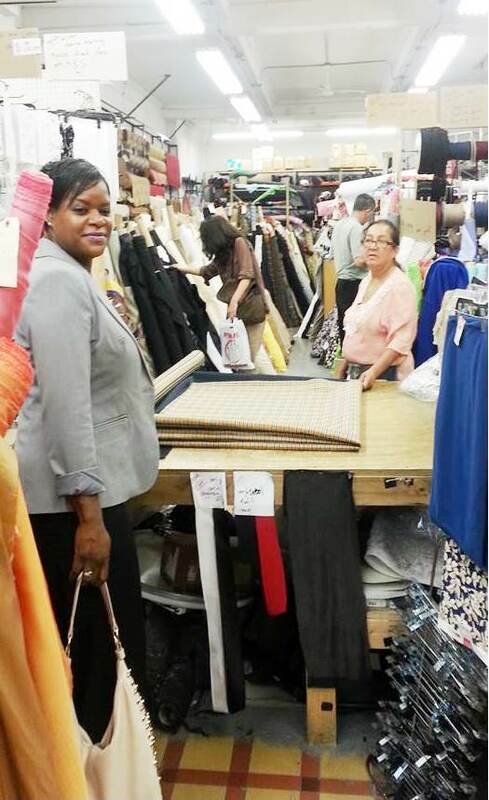 Hi Faye, Alethia of Kassminscreations and I were discussing sometime back pattern organization. She further explained how she organizd her patterns and was inspired. My patterns are stored in old audio cabinets in the basement. Pulled them all out and separated them by garments, pattern company and then put in numerical order under the pattern company. 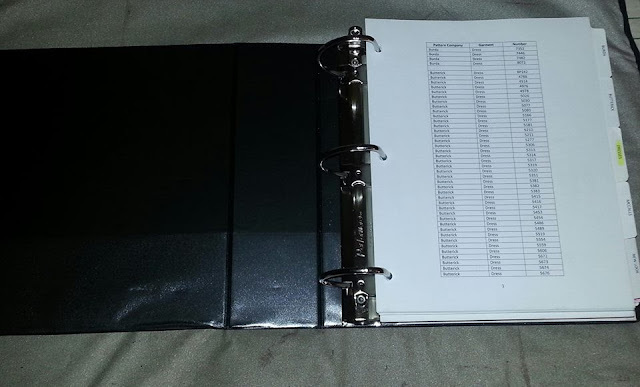 Tediously, I logged the pattern info into simple columns, uploaded the cover picture of each pattern from PatternReview and save all the info in a word document and printed to be placed in a binder. 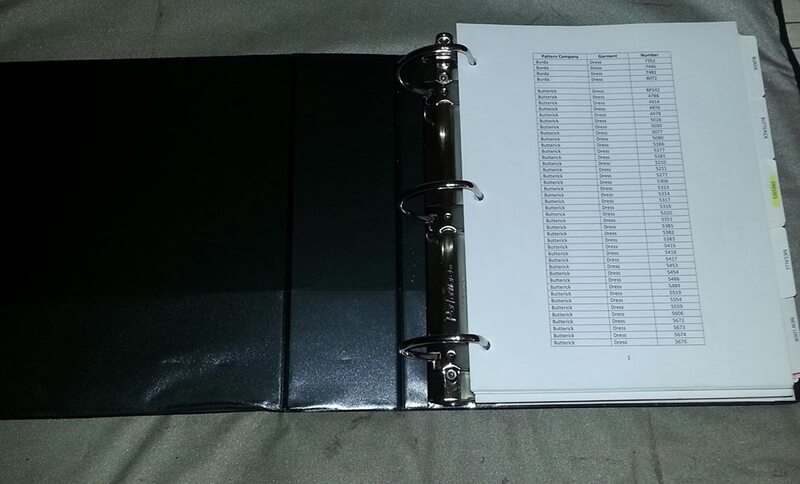 I inserted dividers labeled with pattern company and sub dividers with garment name for easy reference. I need to update it, I have purchased several more patterns since. Its a great way to refer to your patterns without having to physically handle them. In my case it keeps me from having to schlep to the basement. Hi Omega, oh its definitely time for another meet up. Matter of fact when we met last it was a blistering hot day, but super fun. 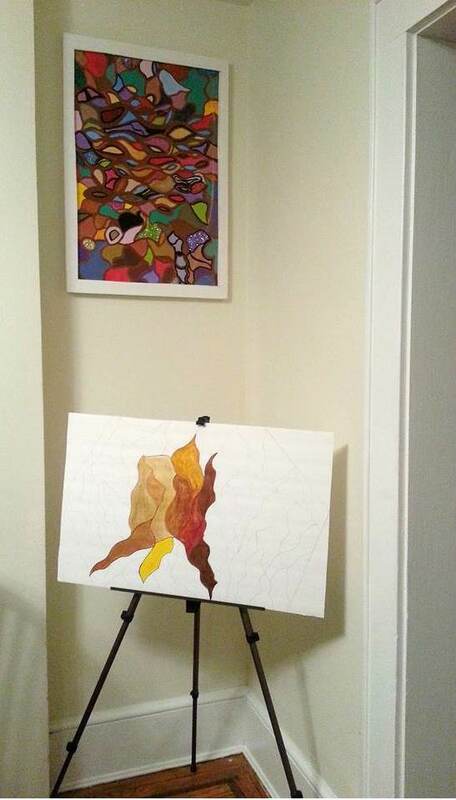 Sewing will remain constant, but I need diversity and finally took my doodling to painting instead of only doodling in the course of meetings. Over years, I have accumulated so many notepads of my doodling while in meetings...lol. Try sewing a simple garment to get your mojo back. Let me know the date and I will be ready for our meet up. Wow, what a lucky find with that Burbery reversible fabric. What a fabulous coat it will make. LMAO Sheila, I am still cooling down after our last meet up :-). As a matter of fact, I'm still getting hot flashes thinking about it but at least I am laughing. Trust me, the next time will be in much much cooler weather. Great find on the fabric and I look forward to seeing the new coat. The "doodling" is beautiful. I think once you get the pattern log done, it makes your life so much easier. I have been using the Bento app for my log. I avoid making duplicate purchases :-) because I can look at what I already have on my phone. Thanks Rhonda, I would love to do a reversible coat and doing a lot of googling for ideas. Any suggestions would be truly appreciated. Thanks Sister. It is a great convenience, but I try not to do it too often. Hey Sewing Diva. The coat will be a challenge, so for now I'm just loading up on info and any suggestions you or others may have. This morning I pulled out a few simple style-line coat patterns to get some ideas. Not only does she sew, she doodles:) Have you ever thought of turning your doodle into fabric? There are products I have used in the past to transfer a picture onto a fabric and then make a clutch purse from it. I don't mean the iron on type. The one I speak of has more endurance. I also would have beat a hasty retreat from merchants w/o AC. Hi Syl and Thanks. I never thought of that and classifying you as an enabler...lol. I remember when you did the shoes... fantastic. I love the doodle!! What a lovely coat you will have. Your fabric shopping venture paid off! I am so envious of you sewists who have real fabric stores to go and shop in person!!!! Fantastic fabric can't wait to see the coat. We get the same kind of heat her is VA I fell your pain. Oh Sheeeelah...(like Prince - remember that song?). I love hearing about different fabric shopping experiences. I love, love, love the fabric you purchased. That is going to make a gorgeous garment. I'll keep this place bookmarked! Fabulous...just fabulous!! !